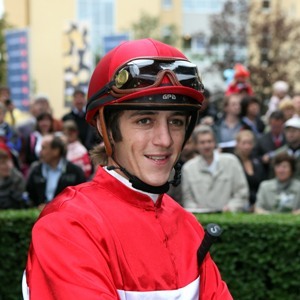 Christophe Soumillon is the son of a retired jump jockey turned trainer was initially apprenticed to Cedric Boutin while attending the Moulin a Vent school in Chantilly, where many other French riders have learned their trade. He rode his first winner on 7 November 1997 aboard 75/1 shot Bruni, trained by Boutin. Champion apprentice in 1999, Soumillon was signed up as apprentice to the all-conquering Andre Fabre stable and Thierry Jarnet’s departure at the same time meant that he was effectively second jockey at the yard. He won his first French Derby in 2001 on the Carlos Lerner-trained Anabaa Blue and, following Gerald Mosse’s departure to Hong Kong, Soumillon took over as retained jockey to the Aga Khan in France in October 2001. As a result of that association, Soumillon rode the great unbeaten Zarkava in each of her seven races, winning five Group 1 contests, including the Prix de Diane and Prix de l’Arc de Triomphe in 2008. Other major wins have included the Breeders’ Cup Turf (2005 Shirocco), the King George VI & Queen Elizabeth Stakes (2006 Hurricane Run), as well as Britain’s richest race, the QIPCO Champion Stakes (2011 Cirrus Des Aigles), the final race in the QIPCO British Champions Series. In 2012 he notched up a second QIPCO British Champions Series victory on Giofra in the Etihad Airways Falmouth Stakes. Soumillon is no stranger to controversy and had a fracas in a Hong Kong bar with trainer John Moore’s son in December 2008. He also had a widely publicised spat with trainer Andre Fabre and it was announced in August 2009 that his retainer with the Aga Khan was to end, a move that shocked the jockey. However, he resumed as the Aga Khan’s retained jockey in France in 2014. In 2013 he rode Cirrus des Aigles (who he now looks after at his home) into second place in the QIPCO Champion Stakes, a neck behind the winner, Farhh, and followed that with two brilliant victories in France in 2014, beating Arc heroine Treve in the Prix Ganay and then winning the Prix d’Ispahan. Next they went to the Investec Coronation Cup and won his third Group 1 in a row, something he had never done before. Then he was second on Narniyn in the Markel Insurance Nassau Stakes. In June 2010 he made his debut over hurdles and, four days later at Auteuil, he enjoyed a first success in that sphere when racing to a wide-margin victory in the French Champion Hurdle atop Mandali. He has been champion jockey in France six times, the most recent in 2013. Soumillon, who is married to a former Miss France winner, enjoys paintballing, go-karting and riding his Welsh pony in the Chantilly forests with his two Jack Russells as an escape from racing. In 2016, he steered Almanzor to a superb win in the QIPCO Champion Stakes.